Castle Rock residents who love to garden organically or simply want to give it a try have an opportunity close to home. 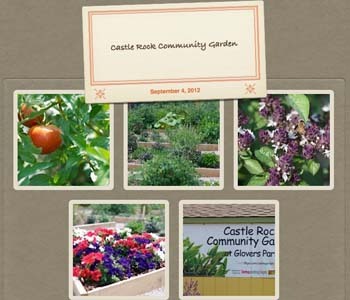 In 2012, the first public community garden opened in Town – the Castle Rock Community Garden at Glovers Park. This project was approved by the Parks and Recreation Commission and Town Council. The garden has also become its own 501(c)(3) nonprofit organization through the Douglas County Community Foundation. Residents can lease plots to garden. Applications for individual plots will be accepted beginning April 1. There are 23 plots available. Plots are granted one per household on a first-come first-serve basis. Gardeners keep what they grow, but are encouraged to donate some of their produce. The group is looking for donations such as deck screws, untreated pine, wheelbarrows, garden tools, hoses, hose holders, decorative planters, benches, etc. A special garden bed for school groups – something more hands-on and educational – as well as ADA- accessible garden beds were added in 2014. For more information, plot applications or to get involved, email the garden group or call 303-884-8947. Alternately, visit the Community Garden blog. The Town of Castle Rock Parks and Recreation Department supports this project, but it is a community-based and community-run effort.